Ryan Pace’s decision to decline the option on Josh Sitton needlessly creates a big hole in the middle of the Bears offense. There’s no doubting that Sitton isn’t the player he once was, but he was still better than most other guards in 2017. He was stout against the run, held his own as a pass-blocker and — despite his age and, well, shape — his ability to get to the second level was still top of the league. Sitton is a big reason why the Bears have been among the best rushing attacks in the league the last two years. Sitton wasn’t cheap. But he wasn’t expensive either. His salary cap hit of $8 million would’ve put him 13th among guards. If the Bears try to upgrade in free agency, they’ll almost certainly have to pay more. Sitton’s ex-teammate T.J. Lang, one of the top guards in the 2017 free agent class, signed for $28.5 million over three years; $7.5 million more than Sitton received from the Bears. Lang’s cap hit in 2017 was $10.9 million and jumps up to $11.7 million in 2019. The Bears could look to the draft to replace Sitton. Quenton Nelson is a popular name, but using the eighth pick on him seems rich. But Nelson would immediately be slated to make more than Sitton did and about as much as Long earned in his last contract. And there are other questions about Nelson’s athleticism that need answering going forward. This draft figures to be rich at guard, and the Bears could nab a starter in the second round, but why not keep Sitton and draft a position of need there? The Bears could’ve had the best coaches in the history of football and they still would’ve lost to the Eagles by 20 points. Say what you will about John Fox and company — and it’s probably all fair — but the hard truth is that the Bears don’t have enough good players. A lot of that is due to injury. Losing their top two receivers and all four starting linebackers is a tough blow. But still, they should be able to put up a fight! Markus Wheaton is paid like a starter. Nick Kwiatkoski should be a starter at this point anyway. Christian Jones has played like one. Deiondre Hall, Deon Bush and Hroniss Grasu should all be starters. Jon Bullard was drafted to be a major piece. He shouldn’t be warming the bench behind a journeyman at this point. Pernell McPhee has turned into a ghost. I like Ryan Pace. Most fans do. I’d argue his plus decisions far outweigh his minuses but nowhere near as much as the losses outweigh the wins. The Bears are at a crossroads. They will, and I still believe should, allow Pace to hire the next coach. But what if they’re 3-8 next year too? Do they just hit the reset button again? How long can they reasonably expect this loyal fan base to be patient? They are currently suffering through one of the worst four-year stretches in team history. I’ve long said the primary reason I wouldn’t want to hire Jim Harbaugh or Josh McDaniels is because they’d want to be Pace’s boss too, but I’m no longer sure that should stop the Bears. New England, Seattle, Kansas City, New Orleans all have their coaches in charge of the rosters. If Jim Harbaugh calls up George McCaskey and says he wants to the keys to the franchise, has Pace done enough for the Bears to justify saying no? Even if you look at first time head coaches the last two years, two of the big fishes were handed the keys to their franchises in Miami and San Francisco. That doesn’t include Sean McDermott, who was given what he asked for after a month or so on the job. We have months to debate the coaching pedigrees of Harbaugh, McDaniels and everyone else, including whether or not they deserve such power. That’s not the point. The point is, how can we be so sure that Pace does? To be clear, this isn’t a call to fire Pace. I think he’s shown that he has an eye for talent. 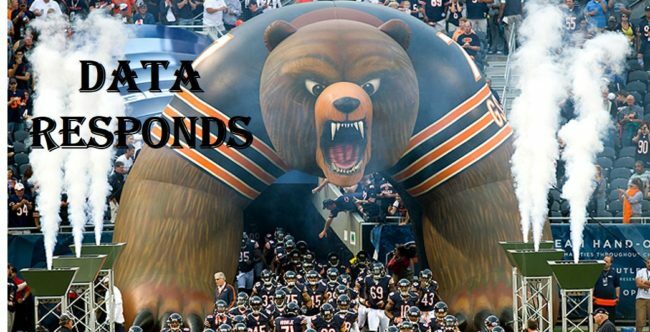 I just hope the Bears don’t let a great football mind out the door simply because Pace has a solid draft record. Hopefully the problem is simple as needing a new coach and another off-season to build depth. I’m just not entirely sure that’s true. This is Year Three, the Bears should be much further along. Blame Fox all you want, but Pace has blood on his hands too. Here’s to hoping he can get it cleaned up. Chicago’s offense had their best game of the year, but their defense played possibly their worst game of the year. All in all, that evened out, but the Bears ended up falling to 3-7 because their kicker is terrible. Now that’s more like it. The offense was finally run like an NFL offense, mixing things up and keeping the defense off its feet, and unsurprisingly it led to good things happening. Chicago stayed run-heavy in the game, but mixed up how they were running instead of making it so predictable, and thus the run game really took off. As a result, the offense scored more than 17 points in regulation for the 1st time all year. This also helped the passing game open up a bit as well, since the Bears didn’t routinely end up in 3rd and long. This was a nice change from how their offense has functioned most of the year. Another nice wrinkle we saw on offense was a number of read-option looks for quarterback Mitchell Trubisky. He kept it several times (though there was at least one more where he should have) and made Detroit’s defense pay for crashing down on the running backs. After ignoring Tarik Cohen on offense for several weeks, the Bears made a point of getting him involved early and often. He had 8 carries and 3 pass targets in the 1st half alone after getting 8 total touches in the previous 3 games. Another nice wrinkle was lining Jordan Howard up as a fullback, with Tarik Cohen at tailback. This set Howard up with a few nice runs as he could spring through the line quickly and the linebackers had to worry about Cohen. Chicago came out of the bye flat, acting like nobody actually wanted to play a football game against their biggest rival. Their terrible kicker was good, but nobody else really was. The only thing that kept this game somewhat close was the fact that Green Bay is terrible, but they still won fairly comfortably on the road. Let’s break down this embarrassing effort. The first drive was simply awful. After two weeks to prepare, they ran into a loaded box on 1st down and lost a yard. After a nice pass picked up a first down, they again ran into a stacked box and lost a yard. The next play was both an illegal formation and a hold, setting Chicago up in 2nd and 21. At that point, the drive was over thanks to a combination of poor play calling and dumb penalties. Rookie quarterback Mitchell Trubisky actually had a pretty good start to the game. He made good throws and got the ball to players in space. That changed as the game wore on and Green Bay dialed up the pressure. Trubisky got happy feet and starting pulling his eyes down from scanning the field too quickly. He also refused to throw the ball away, making him completely inept under any sort of pressure. Green Bay’s five sacks weren’t all on the offensive line, but they were bad today too. Hroniss Grasu, making a start at center and shifting Cody Whitehair to right guard with Kyle Long out, was routinely pushed back into the backfield. The unit also picked up way too many penalties, with a nice mixture of pre-snap, during the play, and after the play mixed in. 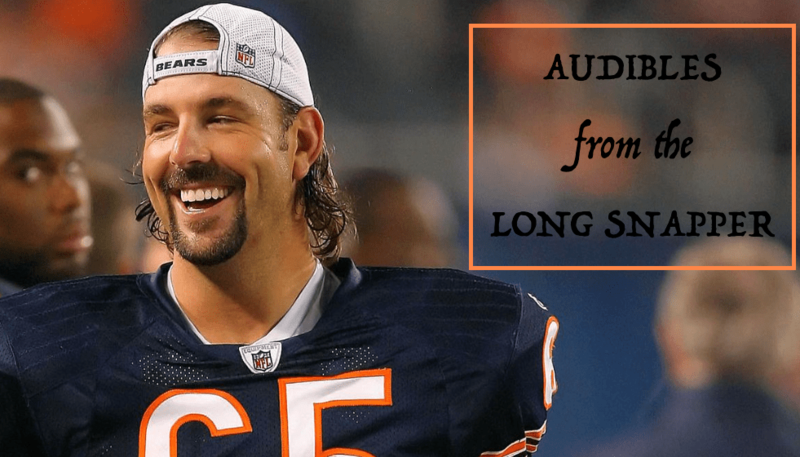 Audibles From the Long Snapper: Mitch, Mitch, Mitch & More! Despite the belief of many, I never had a dislike for Mike Glennon the person. I simply had no faith in Mike Glennon, NFL quarterback. And I am not in the business of sucking up to the Chicago Bears organization around here. They got their Glennon evaluation horribly wrong and I said that from the moment they inked the deal. Said it when many others were rushing to give them the benefit of the doubt. But I’m elated to never write about him again. 4. As scout-team QB, Trubisky didn’t just want to help the #Bears starting defense on some reps, he wanted to beat them. And did at times. There were several players in the defensive meeting rooms comparing what they saw from Trubisky in practice to what they were seeing from Glennon in games. They were incredulous at times. Didn’t add up. That’s how you lose a locker room. Read all of Adam Jahns’ thoughts on the decision to start Trubisky HERE. Pats have allowed 42, 20, 33, 33 in four games. How did Belichick let this defense get so downright awful? Couldn’t they use Chandler Jones? Or Akiem Hicks? In the same way front offices are hurting the careers of Aaron Rodgers and Drew Brees, it’s remarkable how Tom Brady has bailed out Belichick’s evaluative missteps. Pats should probably have one win at this point. There was a point during Houston v. Tennessee where I thought the NFL was changing before my eyes. Watson and Mariota were essentially playing a college game and damn was it exciting. Then Mariota got hurt. Why? Because the style they were playing is not sustainable in this league. George Godsey and Bill O’Brien called a masterpiece for Deshaun Watson, catering the offensive game plan to what he does well. What I loved is how they used Watson’s running ability primarily down around the goal line, not out in the open field. Shorter runs in smaller spaces will limit the explosion in the hits he takes. In a year it was thought the Jets would go 0-16 and draft their quarterback of the future, it’s a bit ironic that the Giants may scoop them and find Eli’s replacement. I know why the Giants offense stinks. But why can’t they cover anybody? Nick Folk can’t be the Bucs kicker next weekend. He almost single-footedly cost Tampa an easy win Sunday, leaving a touchdown of easy kicks on the table with dead shanks. If I were Tampa, I’d call the Niners and offer a mid-round draft pick for Robbie Gould. Bucs can win the NFC South. Why risk that with a shaky kicker? Not sure there’s ever been less athleticism on display at the quarterback position than Carson Palmer v. Brian Hoyer. Two road games, two blowout losses for the 2017 Bears. Green Bay won the first quarter 14-0 after a great opening drive, followed by a 3-yard touchdown after Mike Glennon turned it over on Chicago’s first offensive snap. Things stayed quiet until the end of the first quarter, when a 47 minute lightning delay led to what felt like the start of another game. Of course, the Bears still had Mike Glennon in at quarterback, so nothing changed. He turned the ball over 3 more times and shut down the entire offense with his incompetence before racking up just enough garbage time stats to make his performance somewhat defensible if you squint (stop me if you’ve heard that before). We’re starting here tonight, beginning with the continued ineptitude making appropriate personnel decisions late in a blowout. With all the practice the Bears’ coaches have gotten in these situations in the last few years, you’d think they would be great at it by now, but they’re not. Down 28 points in the 4th quarter, the Bears rode Jordan Howard and Tarik Cohen, their two best offensive players, to a meaningless late touchdown. Zach Miller, their best tight end who has made a career out of going to IR, played while rookie Adam Shaheen sat on the bench. Why? This is literally a fireable offense if the team’s management cares about their personnel at all. Turn the Beat Around: A Trubisky Dinner, Kyle Long on the Move & More! As Pace does with all such get-to-know-you dinners, he asked Trubisky to pick the restaurant and make the reservation. It’s a minor request. But it often can be revealing of a player’s reliability. Pace also ordered Trubisky to keep the meeting top secret, so as not to tip off anyone — not any Tar Heels coaches or teammates, not any other NFL execs or agents, not even a campus meter maid — to the Bears’ interest. Trubisky took the directive and pieced things together. Before Pace and his cohorts arrived on campus, the Bears GM had a text. Dinner at 7 p.m. 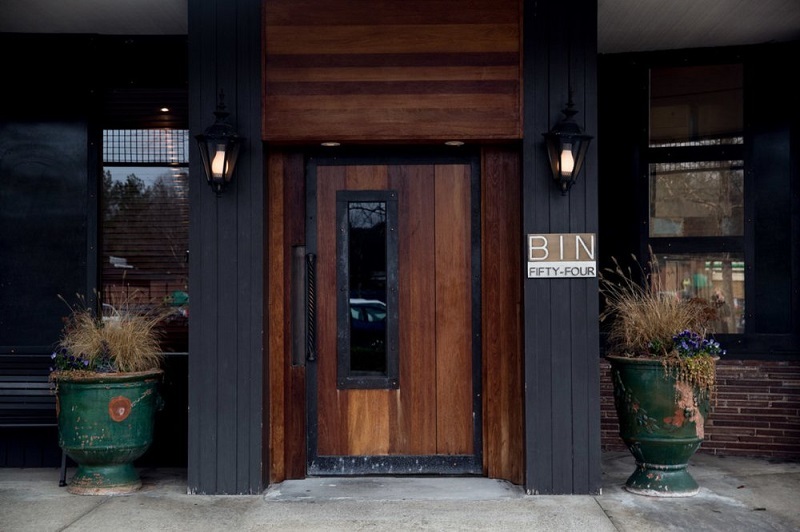 The venue: Bin 54, a top steakhouse in North Carolina’s Triangle region. And to keep the gathering covert, Trubisky made the reservation for six under an alias: James McMahon. “I thought that was cool,” Pace says. Read the entire article. It is the best work Dan has done since coming to Chicago. Kyle Long on the Move? The Bears travel to Tampa for a match-up of two pretty evenly-matched teams. What will tell the tale? The Bears ran the ball with toughness and determination against a terrific Vikings defense with backup guards. From all reports, Josh Sitton and Kyle Long will return to the lineup Sunday. Long and Sitton aren’t just their two best offensive linemen. They are two of the best players on the team and leaders on the field. Their return should be worth 25+ additional yards. Bucs are allowing more than 117 yards per game on the ground at 4.1 yards per carry. If Bears stay committed to the run, and we know they will, they should have tremendous success on the ground. Only one back in the league has a better yards per carry than Jordan Howard. (That would be the revelation that is Jay Ajayi in Miami. Reason #31 you don’t break the bank for CJ Anderson.) Howard isn’t going to beat a healthy Ezekiel Elliot for Rookie of the Year but I expect him to make a formidable argument over the second half of the season. That starts in Tampa. If the Bears run it well, they win. I think they will…and do. The loss to the Colts may have been the most disappointing of the season to me because it ended any chance the Bears had of becoming relevant this season. I didn’t think they’d make the playoffs but I expected the Bears to be relevant. I expected them to a be a team nobody wanted to play and I expected to see serious signs of growth. A win over Indianapolis would’ve put them at 2-3 with a chance to go 3-3 next week before they played the Packers in a Thursday night game. At that point, anything would’ve been possible. But they lost to the Colts, a bad team. Making the loss worse, they Colts are a bad team that was coming off of a trip to another country, while the Bears were coming off of their first win. It was a game the Bears had to win and didn’t. There are still bright spots this season and I can see the light at the end of the tunnel. I think the Bears have a very good GM and a lot of excellent young talent. They actually have a better record through Pace’s first 21 games than the Packers did with Ted Thompson. But that doesn’t make me feel better today. There’s always next year, for most of us anyway. Depending on how the rest of this season goes, that could bring some very difficult questions. The biggest question is the coach and there is no easy answer.